On Tuesday, we noted that the Council on American-Islamic Relations (CAIR)'s condemnation of the Nairobi mall massacre omitted any reference to al-Shabaab and its radical Islamist ideology. Numerous reports indicate that Al-Shabaab gunmen separated Muslims from the rest, allowing the Muslims to go free and live, before slaughtering everyone else in their path. It would be simple to acknowledge the terrorists' religious motivation, recognize that radical Islam is a challenge for Muslims to confront, and perhaps offer specific theological counter-arguments. Sunday evening, CAIR Executive Director Awad took a step in that direction, writing "The killing of civilians in Kenya and describing them as 'infidels' as well as the attack on the church in Pakistan is a brutal assault on souls which God has forbidden and is a crime against our sacred religion." But minutes later, Awad turned logic on its head, comparing the al-Shabaab terrorists with "Islamophobes," or those whose views CAIR doesn't like. Awad's Twitter feed alternates between posts in English and Arabic. This one apparently was not for an English-speaking audience: "The common denominator between the extremists and advocates of Islamophobia (creating fear of Islam) is that both believe that a perverted view of Islam is the foundation of religion." Got that? Terrorists who lay siege to an African shopping mall and slaughter dozens in the name of God are kind of like people who criticize radical Islam. Other recent Awad Twitter posts further expose his warped value system. In two posts Tuesday evening, Awad said he skipped a meeting with new Iranian President Hassan Rouhani, who was in New York to address the United Nations General Assembly, "because of his government's position in support of the regime of Bashar al-Assad and the massacres and the destruction of the Syrian people taking place." He did not attend last year's meeting, either, Awad wrote. But he did meet with previous Iranian President Mahmoud Ahmadinejad before. 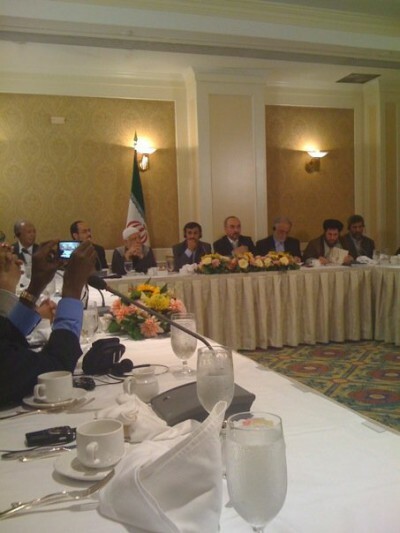 Ahmadinejad's Holocaust denial and his repeated vows to wipe Israel off the map were not enough for Awad to bypass speaking at a 2009 interfaith event with the Iranian president. According to a letter from Joseph Gerson of the pacifist Quaker group, the American Friends Service Committee, Awad "stressed that Islam teaches the importance of justice – even in response to enemies, and that terror must always be condemned and rejected." Apparently, terror also must be used to make offensive non-sequiturs equating murderous attacks with political foes. If you live for the next world you will gain this one, If you life for this world you will loose them both.